Microsoft (s MSFT) has set up an epic quest for the Xbox — to turn the box commonly accepted as a video game platform into the centerpiece of a consumer’s living room. And in a private press event last week, Microsoft entertainment and digital media president Nancy Tellem and Xbox Entertainment executive VP Jordan Levin unveiled one key stepping stone in that quest: Original content. Signal to Noise: A six-part documentary series created by Simon and Jonathan Chinn, Signal to Noise focuses on the rise of modern technology, with each film directed by a different high-profile talent. For the first installment, Atari: Game Over, director Zak Penn and Microsoft investigated the myth that Atari buried millions of unsold games in the New Mexico desert. Humans: An adaptation of a Swedish show, co-produced by the UK’s Channel 4, Humans is a sci-fi series about humans dealing with the consequences of artificial life. The series is scheduled to premiere in 2015 (with casting beginning in May 2014), but a trailer screened during the press event, using footage from the original Swedish series, was effectively creepy. Halo: Halo is one of Microsoft’s most high-profile properties, and there are two concrete projects based on the blockbuster franchise — an original series executive produced by Steven Spielberg (which was announced last year), and a digital feature executive produced by Ridley Scott’s Scott Free Productions and directed by Sergio Mimica-Gezzan (Battlestar Galactica).While no details were available regarding the Spielberg series (according to Tellem, it’s in “active development”), production has begun on the digital feature, which is due out in October, and will be released on an episodic basis (similar in style to the last Halo digital series, the Machinima-distributed Forward Unto Dawn. These are just the set projects — Microsoft also has a wealth of other properties in development, including a variety series from the comedy collective JASH, a stop-motion series by the creators of Robot Chicken, and shows based on books by Warren Ellis and Chuck Dixon. 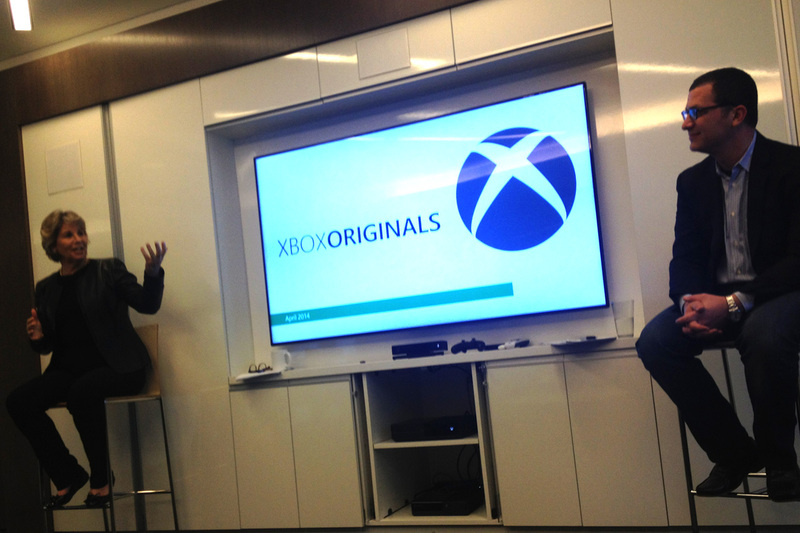 Nancy Tellem and Jordan Levin, during last week’s presentation of Xbox’s upcoming original content. But the Xbox team is moving cautiously — of the properties presented, only a few had firm premiere dates. The rest were listed as under development, for release in 2015 or maybe even later. And several shows — including Humans, Halo and Every Street United — went straight to series. “For some, they need the pilot, but some we’re developing a different way,” she said. One thing Tellem emphasized was the integration of interactive elements into every project, a process which begins at the very beginning of the development process. “We have 200 people in Vancouver working with us to develop tools and interactive features that enable social community and deeper interaction with the content itself,” Tellem said. What shape might that take? Tellem mentioned a few examples: During Bonnaroo, those watching can queue up for a chance to Skype with bands that have just gotten off stage. And for the unscripted reality series Fearless, the use of multiple GoPro cameras during the shoot offers a variety of angles on the action — angles which viewers will be able to choose themselves. Currently, new Microsoft CEO Satya Nadella hasn’t applied any success metrics to what the Xbox team is developing. “He’s very much committed to what we’re doing, and has a really interesting focus on the consumer and usage. We’re a challenger — we’re starting something, we’re not the incumbents, and he respects innovation and risk-taking. I’ve gotten nothing but a very positive response and commitment to what we’re building here,” Tellem said. Yup, they are “aiming high” and completely missing the target. Too bad they couldn’t have “aimed higher” when it came to the failing console’s core specs!